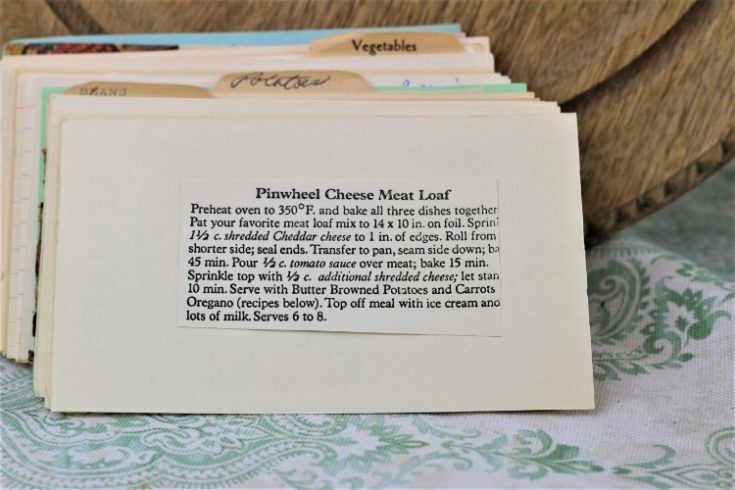 Front of the recipe card for Pinwheel Cheese Meatloaf. 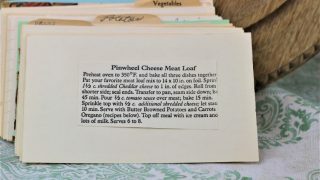 There are lots of fun recipes to read in the box this recipe for Pinwheel Cheese Meatloaf was with. Use the links below to view other recipes similar to this Pinwheel Cheese Meatloaf recipe. If you make this Pinwheel Cheese Meatloaf recipe, please share your photos and comments below! Preheat oven to 350°F. and bake all three dishes together. Pat your favorite meat loaf mix to 14 x 10 in. on foil. Sprinkle 1½ cup shredded Cheddar cheese to 1 in. of edges. Roll from shorter side; seal ends. Transfer to pan, seam side down; [bake] 45 min. Pour ½ cup tomato sauce over meat; bake 15 min. Sprinkle top with ½ cup additional shredded cheese; let stand 10 min. Serve with Butter Browned Potatoes and Carrots Oregano (recipes below). Top off meal with ice cream and lots of milk.